How was your first day of the #eatmindfully challenge? I’ll be checking in every day this week to see how everyone is doing and share some of my experiences from the challenge. And you can join the challenge at any time this week, so no worries if you haven’t started just yet! Day 1 was challenging for me. I realized that even if I’m not checking my phone or computer while eating my mind is still elsewhere. It’s paging through my to-do list, it’s remembering that thing I have to add to my to-do list, it’s fast forwarding to tomorrow, it’s backtracking to what happened yesterday. And before you know it, my meal is over. I realized that by removing tangible distractions, I still have one big ol’ distraction to deal with – my thoughts and my mind. So, I tried to reset my thinking and focus on the food in front of me by counting the number of chews, slowing down by putting my utensils down in between bites, and closing my eyes every now and then to shift the focus inward. It wasn’t easy. It’s hard when our brains are hardwired to always be ten steps ahead to slow that down. I’m hoping it will get easier as the week goes on. What struggles or challenges or wins came up for you yesterday? Would love to hear about them in the comments below. I thought it was fitting to post this recipe today because nuts are one of those snacks that if you don’t eat mindfully, they can quickly become a calorie bomb. A serving of nuts is 1/4 cup and about 200 calories or so. Mindlessly eat 1 cup of nuts and you see where the problem lies. I also posted this recipe today because I’m heading to Anaheim, CA for Expo West on Thursday through the weekend and I love packing along homemade snacks when I’m on the road. It’s so much better than relying on airport food. Plus, nuts are packed with protein and healthy monounsaturated fats so they’ll be sure to fuel me throughout the Expo floor. I made a batch of 2 cups that I’m sure will last me and Steve through the weekend. Oh yes, Steve’s going too. This is our first work trip together! It’s so funny/weird to watch our worlds merge into one. 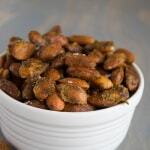 I was inspired by the idea of flavoring roasted nuts with pesto when I went on the California Almonds tour last year. 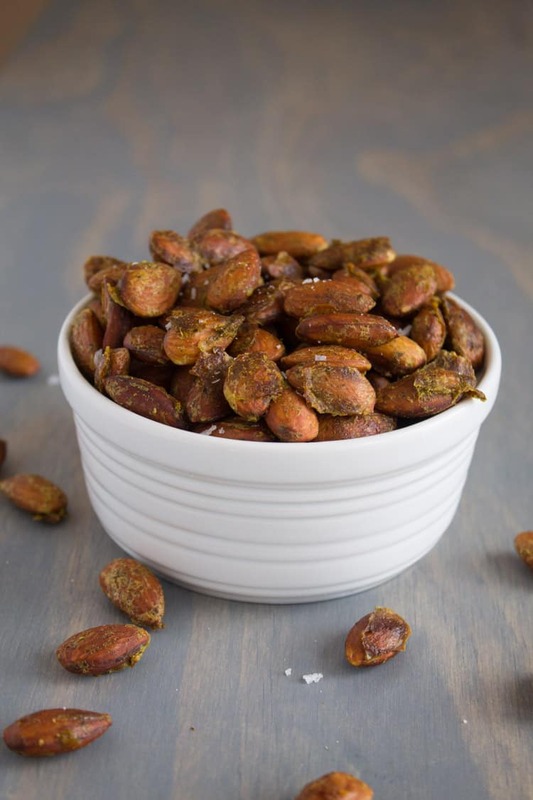 They served these basil parmesan roasted almonds that were just fabulous. I had a bunch of arugula pesto leftover from recipe testing for a client that I figured why not toss some of the remaining with almonds for a quick & easy travel-snack! I’ve also been spooning a dollop of the pesto on top of my scrambled eggs in the morning :). Combine all ingredients in a food processor and pulse until combined. Salt and pepper to taste. Blend 1/4 cup pesto with egg whites in a blender or food processor until combined. 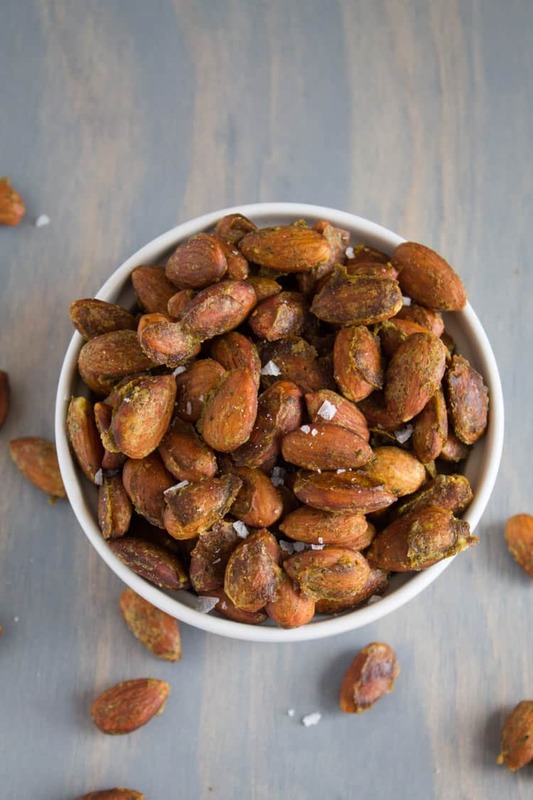 In a medium bowl, mix together almonds and pesto-egg white mixture until almonds are covered. Using a slotted spoon, transfer almonds to the baking sheet, leaving any excess liquid behind in the bowl. Bake for 30-40 minutes, or until pesto has dried and almonds are crunchy, moving the almonds around halfway through. Let cool and salt to taste. Store these bad boys in an air-tight container to keep fresh and pop a handful for a satisfying snack that has some serious staying power to hold you over till your next meal. Feeling nutty? 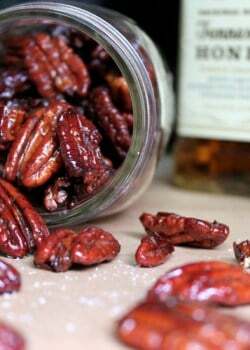 Check out my honey whiskey roasted pecans while you’re at it! 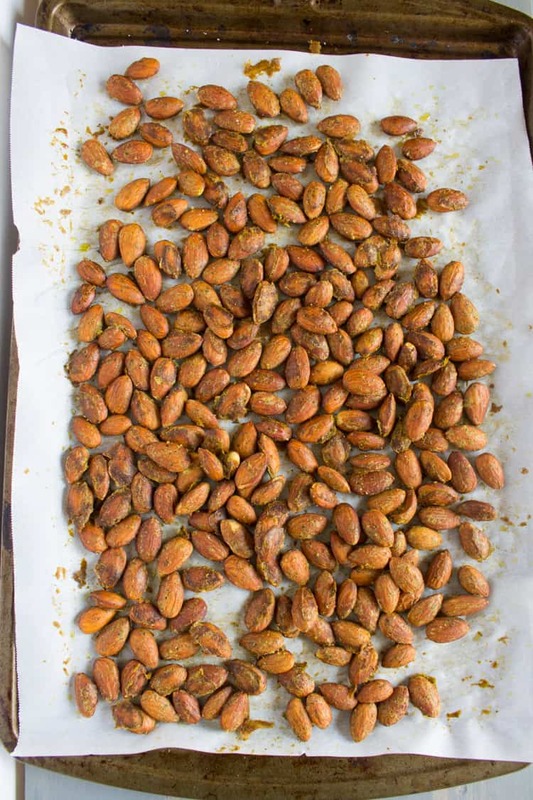 What’s your favorite way to roast/flavor nuts? This is such an awesome idea!! I love pesto! <3! I’ve never seen anything like this, love your use of pesto! So creative, and yum! First of all, LOVE the idea of pesto roasted nuts but also eating mindfully…something I TOTALLY need to work on. Thanks for the motivation! 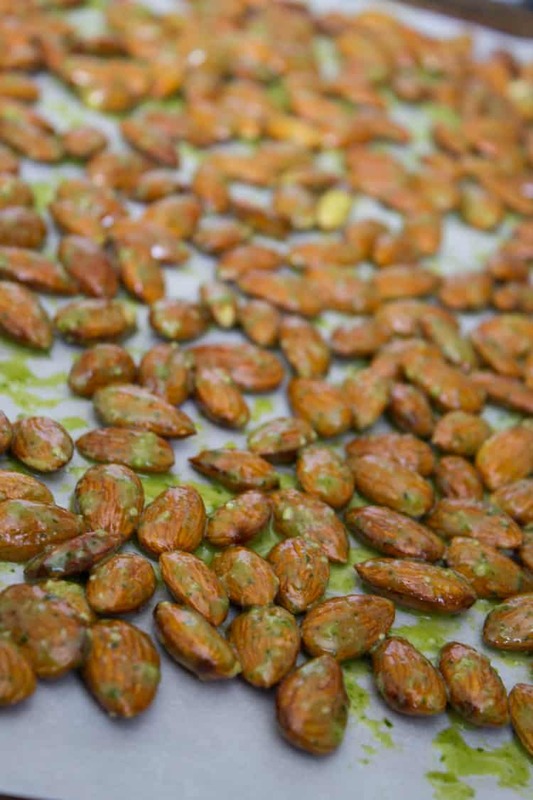 These arugula pesto roasted almonds look delicious! I love arugula, parmesan cheese, and almonds… so I bet this will be a favorite! Pinning to try soon! Thanks, Jess! We had gorgeous weather – going to miss it! This is so creative!! I just made mixed nuts but now really want a savory version!! Awesome recipe! yum! have a great time at Expo West – so jealous! These look so yummy!! 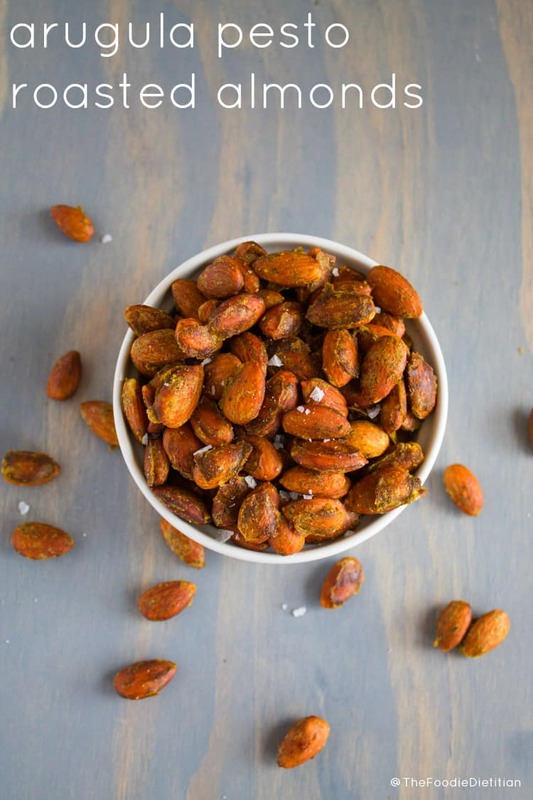 I’m always drawn towards the sweeter nuts, so I am loving the savory flavors going on here!